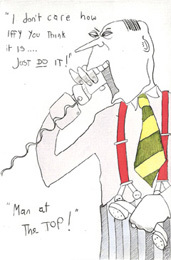 The absurd in the worlds of Wine, Sport, Business and the Professions, brilliantly deliniated by the great humourist and printmaker Tim Bulmer. Original etchings printed and hand-coloured by the Artist. 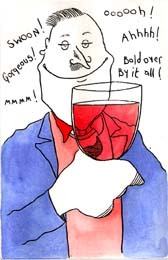 The absurd in the world of wine - brilliantly deliniated by the great humourist and printmaker Tim Bulmer. Original etchings printed and hand-coloured by the Artist. Signed limited edition humorous etchings about Golf, Cricket and Rugby by the celebrated Yorkshire cartoonist. Limited edition etchings depicting humour in the world of Finance, the Law and Medicine by the popular Yorkshire cartoonist.